Special 2-5 is the fifth level of Special 2 in Super Mario 3D Land. It is based off World 4-5. The player starts out on a platform, they must jump onto the above platform and then activate a Snake Panel to proceed to the next platform. There they must activate another Snake Panel which leads to a gap before with a platform after it. On the next platform the player must activate another Snake Panel that leads to a higher-up platform, at the end of the Snake Panels are three Brick Blocks, the one in the center contains a power-up. At the end of the platform are two Brick Blocks and a ? Block, the two Brick Blocks both contain 5 coins, but the ? Block contains a Poison Mushroom. 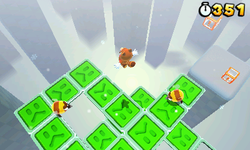 The player must then activate three Snake Panels to reach a higher platform that has three Stingbies and a Warp Box on it that is used to warp to the next area. The next area contains the Checkpoint Flag and two more Snake Panels that lead to three separate Warp Boxes, the closest Warp Box warps the player above the Checkpoint Flag and allows them to collect a + Clock, the Warp Box closest to the bottom warps to the second Star Medal and the final Warp Box warps to the next area. The next area contains three Snake Panels that the player needs to use to create some platforms to reach two more Snake Panels, the one adjacent to the platform of Snake Panels leads to the original platform whilst the other leads to a Warp Box that will warp the player to the final area. In the final area the player must utilize the Snake Panels to reach the top of the Goal Pole. Star Medal 1: Located on the highest Snake Panel after the first multiple switch. Star Medal 2: After three Stingbies the player needs to go to the Warp Box closest to the bottom, it warps them right in front of the Star Medal. Star Medal 3: After activating three Snake Panels the player needs to jump onto the first step created by the panels and then jump towards the left of the screen to a platform that contains the third Star Medal.